Nashville blues guitarist Mark Robinson picked an odd place to move once he “quit his job” to play guitar, the Music City not especially known for blues music after Jimi fled Jefferson Street for London all those years ago. 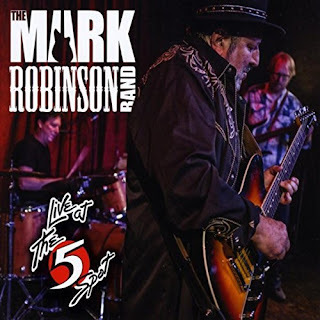 So mark Robinson as a trailblazer in the city’s growing blues-rock scene that includes talented fellow pickers like Ted Drozdowski and recent immigrants like Keb’ Mo’, Jack White, and Dan Auerbach of the Black Keys. Robinson released his debut album, Quit Your Job – Play Guitar, back in 2010 and followed it up three years later with the equally-impressive sophomore effort Have Axe – Will Groove. Other than a couple of digital single releases, Robinson has been largely quiet as far as recording goes, the guitarist producing an excellent 2015 album by folk-rocker David Olney (When The Deal Goes Down) as well as recordings by Americana artists Ray Cashman and Mark Huff. This absence from the studio makes the release of Robinson’s Live at The 5 Spot all the more welcome. Fronting a classic power trio through its paces during a September 2016 performance at the popular Nashville nightspot The 5 Spot, Robinson takes the opportunity to expand his songs instrumentally and explore a myriad of sonic turf, from blues, soul, and rock ‘n’ roll to jazz and even adding psychedelic textures to some performances. Spanking the amps from note one, Robinson leads the band through “Baby’s Gone to Memphis” a smoky rock ‘n’ soul ripper with great guitar tone, a foot-shuffling rhythm, and Robinson’s smooth, silky vocals telling a tale of losing his gal to “The King.” There’s plenty of twang ‘n’ bang chicken pickin’ to be had, as well as a badass rhythm that evokes the “Peter Gunn Theme,” but the performance takes a cool, clever jazzy instrumental turn as well, leading the listener off into parts unknown before pulling the line back in for a big, bluesy finish. The band ramps up the soul with a cover of the Temptations’ hit “Can’t Get Next To You.” The band acquits itself nicely in mimicking the Temps’ hearty harmony vocals, but it’s Robinson’s imaginative, high-flying guitarplay that drives this stripped-down but mighty powerful take on the Motown classic. Robinson’s original, “Poor Boy” is from the guitarist’s debut album and, as good as it is in its studio version, it’s a hoary beast of myth when performed on stage. Based on a long-lost traditional blues song, Robinson mangles its swamp-rock vibe with jagged, broken-glass guitar licks and drummer Rick Schell’s martial rhythms, delivering the lyrics in an anguished howl befitting the Wolf’s best screeds. The original “One Way Ticket” is a new addition to the Robinson milieu in that it appears on neither of his previous albums; the song’s Chicago blues influences are readily apparent in its deep rhythmic groove. Robinson and the gang play it like Butterfield would, minus the harmonica but with a sturdy, steely bass line courtesy of Daniel Seymour and fine brushwork and cascading beats from Schell, atop of which Robinson embroiders his multi-hued fretwork. After spending some time in the Mississippi Hill Country, Robinson put the experience to good use in penning the darkly delightful “I Know You’ll Be Mine,” a stomping ‘n’ stammering force of nature that reminds of the great R.L. Burnside and Junior Kimbrough without being derivative. Schell’s drumbeats hit your ears like a sledge hammer, Seymour’s underlying bass pumps like a heartbeat, and Robinson’s guitar squeals like a tortured instrument as he cuts through the mix with menace and purpose. By contrast, Robinson’s “Under Her Spell” is exotic in an entirely different manner, the guitarist taking his cue from Carlos Santana and embellishing his performance with an undeniably hypnotic Latin groove that reminds a little of Fleetwood Mac’s Peter Green and “Oh Well” in its instrumental virtuosity and trembling tone. The band’s shuffling rhythm is the perfect backdrop for the guitar, with Seymour throwing in an underlying bass line that serves as a perfect complement to Robinson’s guitar. Befitting its real-world inspiration, “Drive Real Fast” choogles along with a 600-horsepower heartbeat, the rhythm section’s raucous boogie riff fleshed out by the contributions of guest performers Ben Graves (rip-roaring harp) and Mark T. Jordan (trip-hopping keyboards). It’s Robinson that drives this hell-bound hot-rod, though, his otherworldly guitar licks swirling and dancing atop the mix like a manic dervish as his vocals tell a malevolent tale of rage on the asphalt. The extended jam that closes the song is more in the vein of ZZ Top/Canned Heat styled booger-rock than aimless noodling, every instrument meshing like gears in a high-performance engine. Live at The 5 Spot closes out with a fiery rendition of bluesman Eddie “The Chief” Clearwater’s “Wouldn’t Lay My Guitar Down,” Robinson playing it straight in paying tribute to the Chicago blues legend with a rockin’ performance that rolls heavy on wiry guitar licks and big beat rhythms.